Zee Cine Awards is one of the most prestigious Film Awards honoring some of the best Movies of the Hindi Film Industry. The awards ceremony which was first started in 2004 has been hosted in some of the top cities of the world from Dubai, London, Mauritius, Malaysia etc. The award ceremony which was named Zee Cine Awards 2018, honoring the films released in the year 2017 was held in Mumbai on 19th of December. All the top Actors, Directors, Producers, Writers, Singers, and other talented personnel of Bollywood graced the ceremony with their presence. The list includes Amitabh Bachchan, Shah Rukh Khan, Akshay Kumar, Karan Johar, Rohit Shetty, Sri Devi, Ranveer Singh, Priyanka Chopra, Katrina Kaif, Jaqueline Fernandez, Alia Bhatt etc. The show was hosted by Rohith Shetty, Karan Johar, Bhumi Pednekar, and Sunil Grover. Zee Cine Awards felicitated Bollywood Baadshah Shah Rukh Khan with a special honor for his contribution to the Cinema and TV for 25 years. While Alia Bhatt won the best female actress award for Badrinath ki Dulhania, the best director award was won by Ashwini Iyer Tiwari for the film Bareilly ki Barfi. Veteran actors Akshay Kumar, Anil Kumar, and Sri Devi also grabbed awards for their performances in Jolly LLB, Mubarakan, and Mom respectively. Young actors like Varun Dhawan, Nidhhi Agarwal, Matin Rey Tangu, etc., grabbed the awards for the performances in various films. Many of the talented singers, scriptwriters, choreographers, musicians, etc., were also honored for their contribution. Despite the release of many of the high budget films starring the stars of Bollywood, many of the films and awards that earned the audience’s applause were of a small budget. Movies like Badrinath Ki Dulhania, Toilet EK Prem Katha, Jolly LLB, Secret Superstar, etc., stole the show in the ceremony. The Magnificent Indian film which presented India in a New light to the world audience grabbed the Extraordinary Franchise award. The show also witnessed many electrifying performances from top artists like Shahid Kapoor, Ranveer Singh, Priyanka Chopra, Sidharth Malhotra etc. 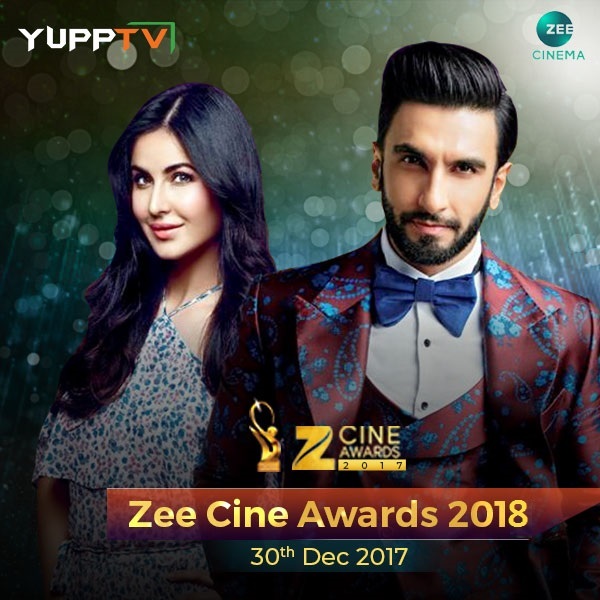 Catch the full show of Zee Cine Awards on Zee Cinema through YuppTV on 30th December 2017.